I happened to be driving through Tecumseh, MI yesterday and stopped by one of my favorite local wineries (yes, I like wine too!) – Pentamere Winery. Whenever I stop there and get wine, I always like to go across the street to The Boulevard Market to get some freshly made Goat Cheese. I’ve been there a few times in the past, but completely forgot about their amazing beer selection (probably pre-MiBeerBuzz.com). I was once again shocked by all of the unique beers they carried. The Michigan beers I saw were various seasonals from Darkhorse Brewing. I also saw some Bells, including the new Double IPA and Christmas Ale 09. Since I have easy access to Michigan beer in Monroe, I snatched up some Lagunitas Brown Shugga’ (an American Strong Ale brewed with dark brown sugar). They had a ton of other great selections, another that interested me was North Coast Brewing’s Old Rasputin. Definitely beers you don’t see at any corner market. The owners also suggested, if I don’t see what I’m looking for, that they could special order it for me. They showed me an order that just came in – a Sam Adams Utopia, around $190 per bottle. 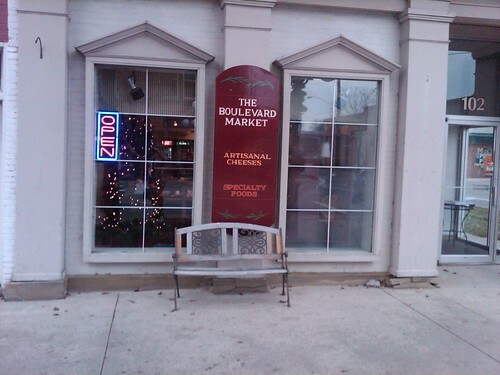 So, if you ever find yourself in Tecumseh, MI and wonder if the town has a good beer store – stop in at The Boulevard Market.. and don’t forget to try some homemade Goat Cheese while you’re there!! This entry was posted in Beer Store. Bookmark the permalink.